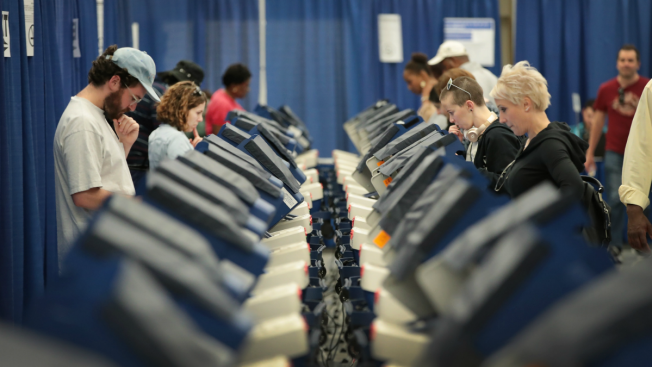 In addition to voting for their candidates of choice, Cook County residents will have a chance to weigh in on various referendum questions using their primary election ballots on March 20. While county officials oversee local elections, the questions specific to certain municipalities will only appear on ballots for residents of those areas, except for one county-wide measure. Shall the State of Illinois legalize the cultivation, manufacture, distribution, testing, and sale of marijuana and marijuana products for recreational use by adults 21 and older subject to state regulation, taxation and local ordinance? Shall the Village of Deer Park be authorized to increase its current Non-Home Rule Municipal Retailers' Occupation Tax and Non-Home Rule Municipal Service Occupation Tax (which together are commonly referred to as "municipal sales tax") from the current rate of 1/4 of 1% of eligible sales to 1/2 of 1% of eligible sales to generate revenue for expenditures on public infrastructure such as Village storm water drainage improvements and roads and streets? State law defines "Public infrastructure" as: "municipal roads and streets, access roads, bridges, and sidewalks; waste disposal systems; and water and sewer line extensions, water distribution and purification facilities, storm water drainage and retention facilities, and sewage treatment facilities. Shall the Village of Flossmoor, Cook County, Illinois, impose a 1% Non-Home Rule Municipal Retailers' Occupation Tax and a Non-Home Rule Municipal Service Occupation Tax (commonly known as local sales tax) for expenditure on Property Tax Relief, Public Infrastructure and Municipal Operations in accordance with the provisions of Sections 8-11-1.1 through 8-11-1.4 of the Illinois Municipal Code (65 ILCS 5/8-11-1.1 through 65 ILCS 5/8-11-1.4)? Should the Village of Forest Park's share of video gaming revenue be used to fund our police and fire pension funds, resulting in lower property taxes? Should the Village of Forest Park continue offering grants to homeowners for flood remediation purposes? Should the Village of Forest Park continue to plow all sidewalks in the community? Shall the Village of Homewood become a home rule community? Shall the debt service extension base under the Property Tax Extension Limitation Law for the Village of Kenilworth, Cook County, Illinois, for payment of principal and interest on limited bonds be increased from $600,000 to $1,000,000 for the levy year 2018 and all subsequent levy years? Shall the Village of Merrionette Park, Cook County, Illinois become a Home Rule Unit? Shall the Village of Niles encourage economic development through valid State of Illinois and Cook County economic development initiatives to promote low property taxes? Should the Village of Niles modernize the Emergency Operations Center? Should the Village of Niles incentivize senior affordable multi-resident housing developments? Should the Village of Northfield continue its non-partisan system of electing its Village President and Trustees, but amend the system so that no primary election would be required and the number of signatures required for ballot eligibility would be set at 50? Shall the Village of Orland Park prohibit video gaming within the corporate limits of the village? Should the Village of Orland Park approve and license Video Gaming within the Village for those establishments, limited in number by the Village, holding Class A Liquor Licenses (restaurants and restaurants with bars) and having conducted business for at least 18 consecutive months with signage conforming to the Village Code? Should the Village of Riverside allow video gambling? Shall the bonds of the Village of Western Springs, Cook County, Illinois, in the amount of $2,000,000 be issued for the purpose of renovating the interior of the Thomas Ford Memorial Library building and furnishing necessary equipment in connection therewith? Shall the limiting rate under the Property Tax Extension Limitation Law for Mount Prospect School District Number 57, Cook County, Illinois, be increased by an additional amount equal to 0.85% above the limiting rate for school purposes of said School District for levy year 2016 and be equal to 3.606% of the equalized assessed value of the taxable property therein for levy year 2017? 1) The approximate amount of taxes extendable at the most recently extended limiting rate is $18,495,428, and the approximate amount of taxes extendable if the proposition is approved is $24,202,123. 2) For the 2017 levy year the approximate amount of the additional tax extendable against property containing a single-family residence and having a fair market value at the time of the referendum of $100,000 is estimated to be $238. 3) If the proposition is approved, the aggregate extension for 2017 will be determined by the limiting rate set forth in the proposition, rather than the otherwise applicable limiting rate calculated under the provisions of the Property Tax Extension Limitation Law (commonly known as the Property Tax Cap Law). Shall the Board of Education of Pennoyer School District Number 79, Cook County, Illinois, build and equip an addition of an academic wing, alter, repair, equip, improve, demolish a portion of and improve the site of the existing school building, including, but not limited to, replacing the existing academic wing of the building with a new academic wing, enhancing building security, improving traffic flow (a drop-off/pick-up lane) and parking, and issue bonds of said School District to the amount of $25,000,000 for the purpose of paying the costs thereof? Shall the limiting rate under the Property Tax Extension Limitation Law for the Berwyn Park District, Cook County, Illinois, be increased by an additional amount equal to 0.078% above the limiting rate for levy year 2016 for park purposes and be equal to 0.414% of the equalized assessed value of the taxable property therein for levy year 2017? 1) The approximate amount of taxes extendable at the most recently extended limiting rate is $1,291,862, and the approximate amount of taxes extendable if the proposition is approved is $1,591,759. 2) For the 2017 levy year the approximate amount of the additional tax extendable against property containing a single family residence and having a fair market value at the time of the referendum of $100,000 is estimated to be $21.86. Shall the Glenview Park District, Cook County, Illinois, construct safety and security improvements at The Grove, improve the Interpretive Center at The Grove, renovate, equip, and expand the Glenview Ice Center, purchase land for park purposes and issue its bonds to the amount of $17,000,000 for the purpose of paying the costs thereof? Shall the Midlothian Park District, Cook County, Illinois, improve, equip and expand the Don Preston Recreation Center, including providing for a walking track, turf multi-purpose room and fitness center, improve and equip parks and park facilities, playgrounds and sites, including providing for a splash park and issue its bonds to the amount of $13,000,000 for the purpose of paying the costs thereof? Shall the extension limitation under the Property Tax Extension Limitation Law for the Bartlett Fire Protection District, Cook and DuPage Counties, Illinois, be increased from the lesser of 5% or the percentage increase in the Consumer Price Index over the prior levy year to 21% for levy year 2018? (1) For the 2018 levy year, the approximate amount of the additional tax extendable against property containing a single-family residence and having a fair market value at the time of the referendum of $100,000 is estimated to be $33.31 in Cook County and $39.61 in DuPage County. Shall bonds of the Leyden Fire Protection District in the amount of $1.5 Million be issued for the purpose of purchasing a new fire ladder truck, a new ambulance and personnel? Shall the extension limitation under the Property Tax Extension Limitation Law for the Prospect Heights Fire Protection District be increased from the lesser of 5% or the percentage increase in the Consumer Price Index over the prior levy year to 4% for the 2017 levy year? For the 2017 Levy Year the approximate amount of the additional tax extendable against property containing a single family residence and having a fair market value at the time of the referendum of $100,000 is estimated to $11.49. If you live in Chicago, you can find your ballot questions here, and if you're in one of the area's suburban counties, you can find your referenda here.